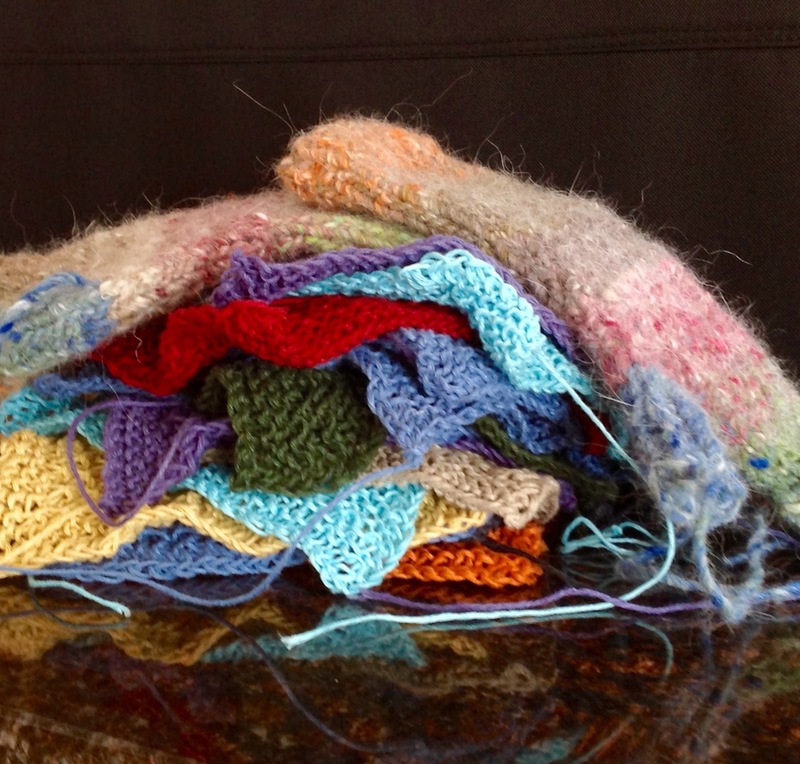 I've been taking a break from painting the last couple of weeks and have taken out the 'needles' & yarn. I like to change up my routine every so often and work with other materials. I am still creating - albeit in a different way, but it does keep the creative juices flowing and I can recharge my 'painting' side of the brain. I have made a couple dozen hemp dish/face clothes - I use these for dishes. These are the best - can reuse again and again and you can throw them in the laundry - they wash up like a charm. Have also completed a couple of pairs of fingerless gloves. I usually carry a bag of knitting 'stuff' with me (and a small sketchbook too!) when heading to the city for appointments, etc. For me there is nothing worse than sitting somewhere and waiting with nothing to do. I love going to yarn stores and checking out the different yarns and colours. 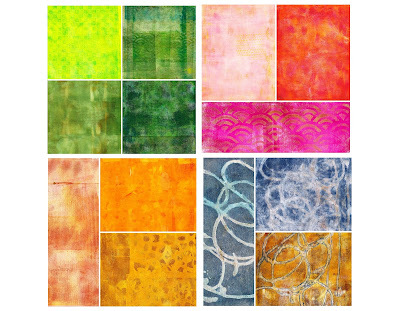 There are so many beautiful colour ways available. I find them very inspirational. Some of my favourite yarn companies are Malabrigo, Manos del Uruguay, The Verdant Gryphon and Noro. And for the record....I am not a great knitter! My knitting repertoire consists of scarves, mittens, fingerless gloves, hats, cowls, the 'washcloths' of course and the occasional lace shawl. The shawls only happen once in a blue moon! I like to knit for family and friends and try to have extra knit goods on the shelf for gifting. Now...if I could only find someone to weave the ends in for me! I have just finished taking another online workshop with the great Jane Davies. 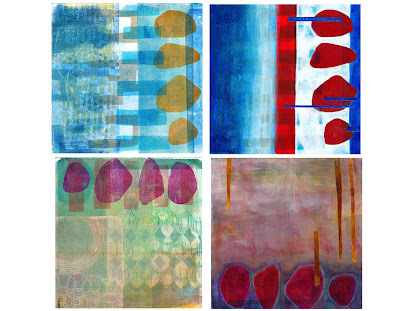 The workshop was Jane's Monoprint Collage. We used the GelliArts gel plate (8X10") with acrylic paint (heavy body and fluid), stencils, mark making tools and lots of paper!! 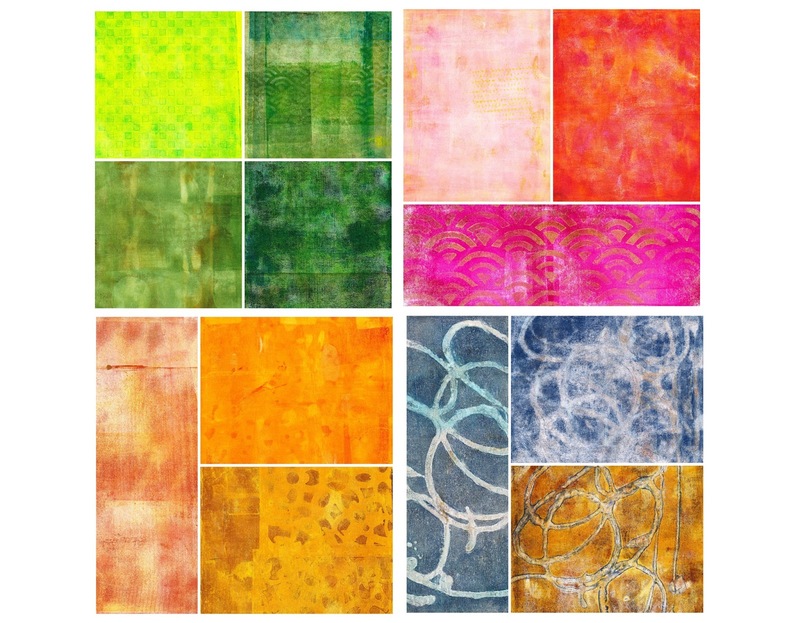 The first 2 lessons had us making collage papers using a variety of techniques - masking , stencilling, layering colours - lots and lots of different techniques....you were only limited by your imagination! I used a variety of paper weights; 20lb up to 80lb. 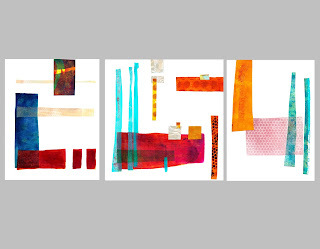 I wanted to see what paper worked the best for printing and collaging with later. I made over a 100 collage papers and there were times that I wished I had more! I have shown a few examples of the papers made below. 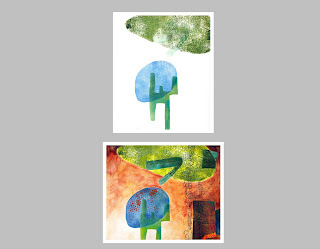 These are images that used main shapes created with stencils and printing. Once printed we worked on the ground and could add more shapes if we wanted using more print and collage and line as well. This is an example of the start and the 'finished' image of one. 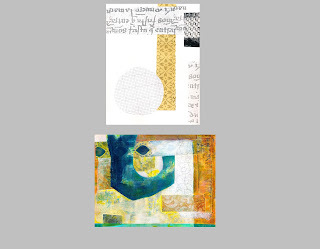 Image is 8"X10"
For this lesson we could start with printed images or collage and then print over the collage. The image below shows the collage start and then the finished image that was printed, painted and had some line work added. 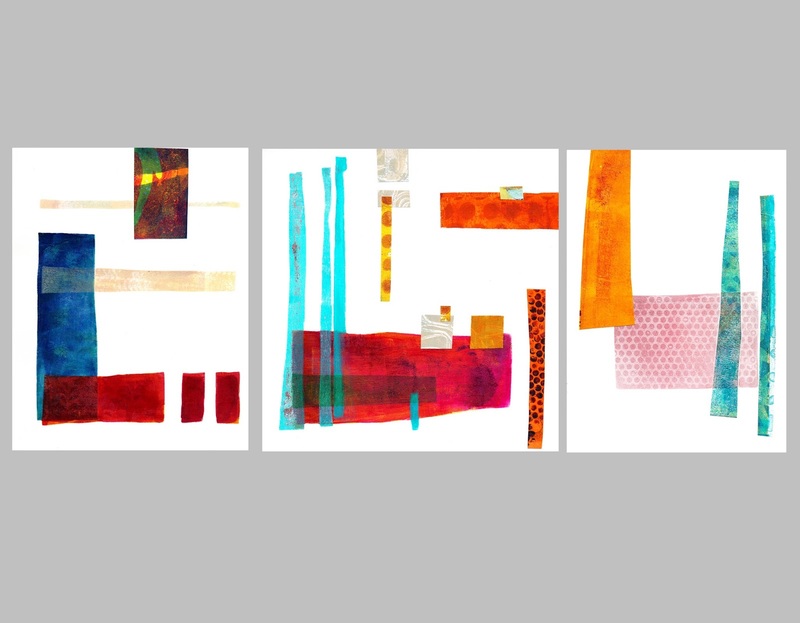 Image size is 8"X10"
And finally the last lesson....using print starts and then cleaning up edges, enhancing or changing colours and adding collage and line if wanted. The images below show the start on the left and the 'finished' image on the right. I have only shown a small sampling of images created in the workshop, but I think it will give you some idea of the work involved and how the lessons built on one another. When I started the workshop I told myself I was going to step outside my box and go with the 'flow'. Hmmm... I think I need to work on this a lot more! I am really looking forward to experimenting more with these techniques and adding them to my art practice. Jane's online workshops are so well done. Each lesson has a 'written' lesson and a video demo. A blog is set up (that can only be accessed by class participants) where you post your work and comments regarding your images for the particular lesson. You can see other participants work and comment if you like. The real bonus is Jane looks at all the work that is posted and provides individual comments to each artist about their work. I really do encourage you to check out Jane's website, sign up for her blog and check out her UTube videos. You won't be disappointed! I meant to share this image earlier. Guess the old adage 'better late than never' will work! I did 'her' last year after taking a mixed media workshop. I did a couple of sketches first and then drew her onto the watercolour paper. 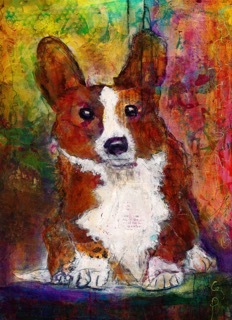 Not sure why I choose a corgi - have never had a corgi - but they sure are cute and have lots of personality! She started me on the path of the Dog Journal and all things 'doggish'! My son took a shine to the picture so I gave it to him...she has a very good home. I did reproduce the image in a card format. I used the company Moo and was really pleased with the quality of the image reproduction. 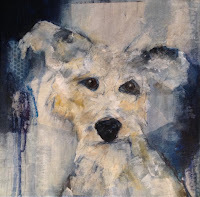 And yes, I really do hope to paint some more dogs!